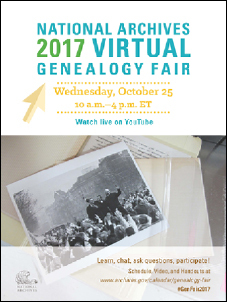 It’s a Fair day at the National Archives, and The Legal Genealogist is late late late in letting you know about it. The festivities get underway at 10 a.m. E.D.T. with welcoming remarks from David S. Ferriero, Archivist of the United States of America. This will be followed by six terrific presentations by NARA archivists ranging from preserving and protecting our own family heirlooms to what’s really still available after the 1973 fire at the National Personnel Records Center in St. Louis to researching a dark part of American history: the internment of many Japanese-Americans during World War II. Alas, by the time many readers even see this post, some or all of the free online presentations of archivists at the National Archives will likely already have taken place. They’re being recorded, and will be added to the NARA You Tube channel: both the video broadcasts and the presentation materials will continue to be available after the live event. If you do see this post in time, you can watch live on YouTube, and many of the slide sets and handouts are already online at the NARA Virtual Fair web page. This session will cover the basic ideas of properly storing and handling family heirlooms. Katie Smith will discuss books, paper, photographs, and a little bit about textiles and other family heirlooms. In particular, she will discuss appropriate storage containers, where to put them in your home, how to handle them properly, and important tips about digitizing what you have. Learn about your 19th century ancestors from Tax Assessment Records in Record Group 58. In these records, you can find information on where they lived and their community, occupations, wealth, and luxury items they may have owned. Researchers familiar with the National Archives at St. Louis usually think of it as a place to investigate the working lives of adults, since it is attached to the National Personnel Records Center. In fact our records cover people “both coming and going” and can illuminate entire life spans. Genealogical information found in our personal data series may include biographical details such as dates of birth and death, parentage, next of kin, and heirs. No Personally Identifiable Information (PII) will be discussed. Daria Labinsky will discuss records series that contain information about pregnancy, birth, paternity, and children including: Project J Files, which may mention children who lived in Japanese internment camps in the Philippines; Chaplain Files, which record baptisms; Panama Canal personnel records and other civilian records series, which may contain information about pregnancies and children; and VA Claim Files, which can include information about paternity. Cara Moore will focus on deaths incurred during civilian federal service as detailed in Record Group (RG) 146, Official Personnel Folders. These record series will range from Prohibition agents to Postal employees to Civilian Conservation Corps enrollees. Some records include information related to the individuals’ deaths, the witness statements around them, and how their services were handled. Through the records of death in service, genealogists can recover details surrounding the death — from the circumstances of the event, to whom the next of kin was, to notification details. When they hear about the 1973 fire at the National Personnel Records Center in St. Louis, many people conclude that the information lost is beyond salvage. Not true. Not all of the burned military records from the fire were destroyed. Information on records that even our staff considered completely lost can now be accessed. The process is called “content recovery” scanning with an infrared camera and is a very exciting development. Ashley Cox will discuss which files were burned and their designation changed from non-archival to archival, making all burn files available for research relatively soon. In addition, she will cover what information was saved from the fire, the journey of records from archival storage to the research room, why time is needed for them to be available for viewing, and how to request them before visiting the archives. During this presentation, we will provide guidance on how to search National Archives Access to Archival Databases (AAD) as well as how to find information on digitized textual records in the National Archives Catalog. We will also demonstrate how to use the information in both systems to get a more complete picture of our holdings of Japanese American internee records. John LeGloahec will explore how to use the Records About Japanese Americans Relocated During World War II, available through AAD. This set of records has become a popular genealogical tool that identifies Japanese Americans interned in several War Relocation Authority camps. Jana Leighton will discuss genealogical information and the availability of records for download from the National Archives Catalog located within two series of Record Group 210: Records of the War Relocation Authority. Many genealogists and scholars researching individuals removed from the West Coast under Executive Order 9066 are familiar with the records of the War Relocation Authority (WRA), the Federal agency charged with relocating and housing those individuals. Outside of these often researched materials are records created by a number of other agencies, including the Immigration and Naturalization Service (INS), the U.S. military and the Federal courts – where many Japanese and Japanese Americans confronted the Federal Government over issues extending from the relocation. Hope you can take in some of the fair, if not in real time then on YouTube when the recordings are available. Will you let us know when the recordings are available, Judy? Or we should just check in with NARA? Checking the NARA YouTube channel is always your best bet (particularly since you can find prior years’ Virtual Fair recordings there too). I suspect that your “oversight” might be a good thing, Judy, because this way more people will learn about this fantastic set of training webinars from NARA. This was an excellent set of training webinars, going into more detail than I’ve encountered so far. Will be rewatching a couple of them to help me develop my research plan for NARA records, and intend to dip into past offerings. I know better now how to use the online records and indexes to id what I need to answer my research questions. NARA staff are amazing. The NARA presenters frequently referred to the differences in law and intent that shaped what was in the different record sets. I kept thinking of you talking about learning about the law in effect at time records are made. I think this stuff is starting to stick!